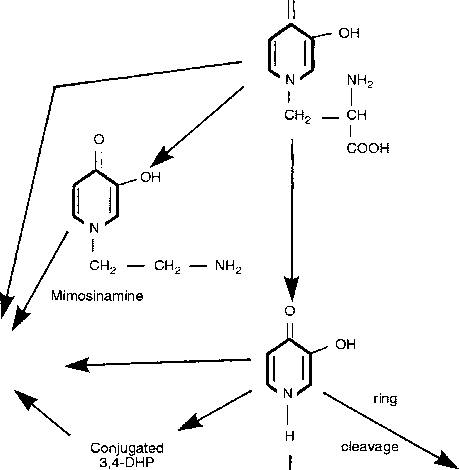 That some of the EAAs (methionine, phenylalanine, tryptophan, histidine and tyrosine) appear to be transferred stoichiometrically from blood to milk, has been taken as circumstantial evidence that these acids are likely to limit the synthesis and secretion of milk protein (Mepham, 1982; Rook and Thomas, 1983). However, we might equally well argue that limiting amino acids could be taken up in amounts well below their output in milk or, indeed, taken up in great excess relative to their output in milk. This alternative view has focused on glutamate (Rook and Thomas, 1983), glutamine (Meijer et ai, 1993) and proline (Bruckental et ai, 1991). Intravascular infusion of glutamate did not affect the yield of milk protein in goats (Mepham and Linzell, 1974) or cows (Oldham and Bines, 1983) so lending no support to the suggestion that glutamate might be limiting. Although abomasal infusion of glutamine increased the output of milk protein in one of two experiments (Meijer et ai, 1996), the effect was put down to stimulated gluconeogenesis because abomasal infusion of propionate had a similar result. The idea of proline as limiting comes from the low mammary uptake of proline itself coupled with the high uptake of arginine, a precursor of proline. This prompted Bruckental et ai (1991) to examine the effect of infusing 80 g day-1 of proline into the duo denum in cows in early lactation and in mid-lactation. In mid-lactation cows, but not in cows in early lactation, infusion of proline led to an increased yield of milk protein. Further investigation of the proline response is long overdue; in the meantime, the basis of the effect remains unknown. 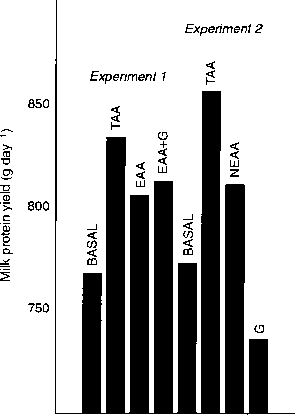 of milk protein in response to duodenal infusion of glucose (Hurtaud et al., 2000), the effect was not evident until 500 g day 1 were infused (250 g day 1 were without effect). And, even then, the response was very small: an increase of <40 g day-1 of milk protein in return for 500 g day-1 of glucose. If the use of amino acids for milk protein synthesis were severely limited by the competing demands of gluconeogenesis, we should expect clear responses of milk protein yield to small amounts of glucose because even 50 g of glucose would release around 90 g amino acid for synthesis of milk protein (Krebs, 1964).